For 20 years now, Santa Claus has been practicing for his big night of heading down everyone’s chimneys by going down the 315-foot “Chimney” at Chimney Rock Park, 30 minutes south of the Inn on Mill Creek. 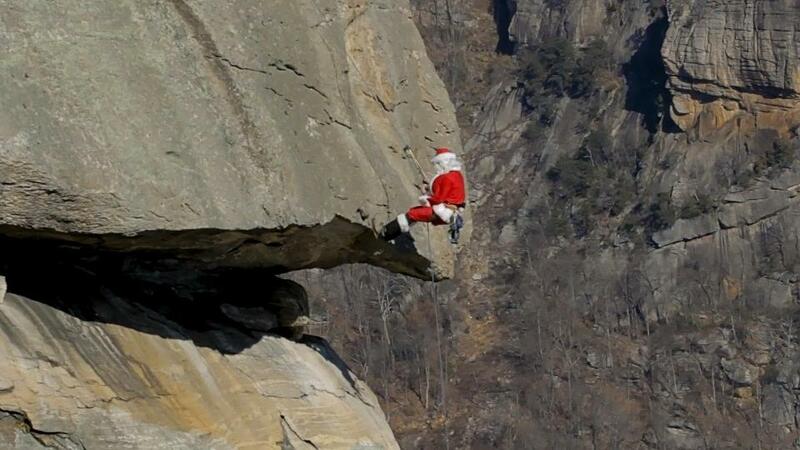 On Saturday, December 8, and Saturday, December 15, 2012, watch Santa climb down Chimney Rock, meet up with him and Mrs. Claus in the park, listen to live music and sip complimentary hot chocolate and cookies. Plus, there will be a variety of activities for kids to enjoy. The event (11am-2pm) is sponsored by Coffee on the Rocks in Chimney Rock Village and is free with the cost of admission. Chimney Rock Park is also home to several trails and the 404-foot Hickory Nut Falls, for those of you who like the outdoors. And as your doting innkeepers, we always remind our guests to be sure to wear layers this time of year if you’ll be hiking outdoors as the weather can be unpredictable. This entry was posted in Uncategorized and tagged festivals and special events, outdoors by Inn on Mill Creek. Bookmark the permalink.